A little less than 36 hours after Blue Jays GM Ross Atkins swapped Ben Revere for Drew Storen, Adkins made an appearance on MLB Network Radio’s Front Office show Sunday morning and had some interesting things to say about the futures of both Jose Bautista and Edwin Encarnacion. Atkins says that he has met with Encarnacion and plans to meet with Bautista within the next week. 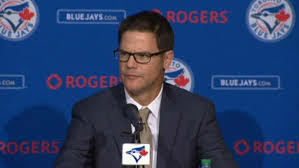 He also added that he wants to extend both Bautista and Encarnacion but haven’t made them any offers. Can’t say I’m overly surprised that Atkins would say that because he wouldn’t be winning himself any favors with the fan base, who seem to have been out for blood after a rather quiet off-season, I will consider this news when it comes out that offers are actually being offered across the table to them. We still don’t totally know whether Aaron Sanchez will be back in the bullpen or used in the rotation as Atkins said that they want to be flexible and not paint themselves into a corner just in case of depth issues. He also didn’t commit to either Roberto Osuna or Storen as the Blue Jays’ closer when the season starts. When it came to the R.A Dickey trade rumors that started to surface after the Storen trade late Friday night Atkins said that while they are willing to listen on anyone, they are not actively shopping Dickey. I would hope if they were that Dickey’s personal caddy catcher Josh Thole goes with him, in a related note, Buster Olney (subscriber only) believes that he doubts the Jays would get an offer that would be good enough, claiming that there are better options out there in the Free Agency/trade market for starting pitching. Although according to a Jeff Blair tweet late Friday night it seems like there is interest in Dickey. I would find it really hard to fathom that the Blue Jays would be shopping Dickey with the shape of their starting rotation, the thought of letting a guy who pitches 200 innings get away almost seems absurd. For what Dickey makes compared to what the going rate is for starting pitching right now it’s almost safe to say that his deal is a bargain for the Blue Jays. I guess time will tell if there is anything more to this story other than rumor. The Blue Jays finished off a weekend sweep of the Los Angeles Angels with a 12-5 win. The win puts Toronto in first place in the AL East a half game ahead of the Yankees who lost to Cleveland on Sunday 4-3. The Blue Jays finish off their eight game road trip with a three game series in Texas starting Tuesday night. The offence all weekend was on fire as they set a new franchise record for runs scored in a three game series with 36. The 2-3-4 of Josh Donaldson, Jose Bautista and Edwin Encarnacion were 9-15 in the game. Bautista and Encarnacion also added back to back home runs in the fourth inning. Encarnacion has extended his hitting streak now to 20 games. Troy Tulowitzki had a pair of hits on the afternoon and hopefully it’s the start of Tulo starting to get the bat going. Ben Revere had another great day at the plate as well as he had a pair of hits, giving him seven for the weekend. Kevin Pillar also added three hits on the day. The Bullpen did their usual bang up job today as Brett Cecil, Aaron Sanchez and Roberto Osuna with the latter striking out the side to end the game in the ninth. Troy Tulowitzki’s heads up play on David Murphy’s double, keeping the tag on Murphy as his feet lost contact with the base, the safe call that was made on the field was overturned on replay, turning the double into a single. R.A Dickey’s first inning was, well, awful as he got touched up for six hits and five runs in the first inning and for a time looked like he may not survive the inning as the bullpen was warming up. Once he got out of the first inning he was excellent as he was able to give the Blue Jays five shutout innings the rest of the way. Josh Thole was 0 for 3 in his return to the big leagues, with the Jays now carrying three catchers on the rosters Thole will probably on catch on days when Dickey is pitching chances of Thole getting any kind of regular at bats will be slim so I don’t expect much from his bat. The only ugly today was the Angels defence which looked bad all weekend and I would imagine drove Angels Manager Mike Scioscia nuts.